The Port of London Authority (PLA) today announced that it is working with the Mayor of London and Transport for London on new research to help develop an Air Quality Strategy for the tidal Thames through the reduction of vessel emissions. The project involves three separate research streams, including shore side power, an assessment of emissions from vessels during trips, and an inventory of all emissions from vessels on the river. "We anticipate more trade, more passenger journeys, more sport and recreation and more people wanting to enjoy along the Thames. Our ambition is for this growth to be sustainable in the widest sense," said Robin Mortimer, PLA's CEO. "This research is on an unprecedented scale for the UK. Individually the techniques are tried and tested, but we are bringing them together to create a detailed picture of vessel emissions on the Thames. This will give us the data we need to develop the first air quality strategy for the river. The majority of the research will be completed by the end of September and we look forward to discussing the findings with our partners and wider stakeholder community then." Specifically, the initiative will consider the feasibility and environmental benefits of installation of shore power at specific sites, gather data on typical regular river borne journeys of passengers and cargo in order to compare to the number of vehicles used, and routes needed, to make the same journey through London’s road network, and will create the a port wide air inventory for the Thames. The research project is being completed as part of the Thames Vision, which is intended to develop a shared view of how river use is expected to increase over the next 20 years alongside city and port growth. 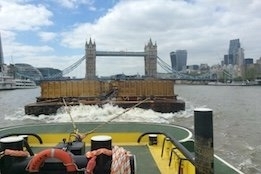 "The river is an important part of London’s economy and at City Hall we are keen to see it used more for freight, passenger and waste movements while reducing air pollution and carbon dioxide emissions from all river vessels," said Shirley Rodrigues, Deputy Mayor for Environment. "City Hall strongly supports the PLA’s work to understand and reduce emissions from river vessels. The Mayor is leading by example by cleaning up the river fleet that he owns. When his two new Woolwich Ferries enter into service next year they will be among the cleanest vessels on the river." 4,200 mt made at Jinling refinery.